The Chapman College Gymnasium, Orange, California. Also called "The Box." 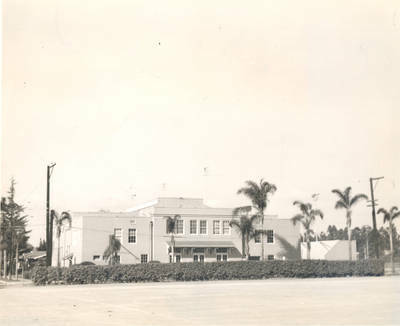 Originally an Orange Union High School building, it was dedicated March 26, 1926 and torn down in January, 1977 to make way for the Hutton Sports Center. BW photograph; 7.75" x 9.5"